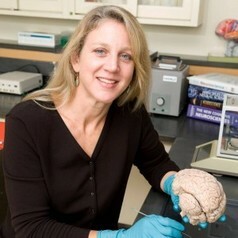 Dr. Lise Eliot, associate professor in the Department of Neuroscience, received her PhD in Physiology and Cellular Biophysics from Columbia University. Working in Eric Kandel's laboratory, she combined electrophysiology and calcium imaging methods to analyze the synaptic mechanisms underlying learning and memory. Dr. Eliot next trained as a Postdoctoral Fellow with Dan Johnston at Baylor College of Medicine, where her research addressed the mechanisms of calcium influx in hippocampal neurons. She joined the CMS faculty in 2002 and currently directs the Medical Neuroscience course for first year medical students, the Ethics in Biomedical Research course for first year PhD students, and the Interdepartmental PhD Program in Neuroscience.